This is old version Yelp 8.15.0 apk for Android, you can install it if you want to downgrade or install old app. It is top Travel & Local apps from Yelp, Inc.
You may find this feature is similar with social media rating but Yelp has something that very different. In social media, people comment or critic are subjective or influenced by marketing view. The owner intends to attract more customers, so he or she writes something exaggerating about product. It is not fair unless comment is from verified user. On the other side, Yelp maintains balance between personal view and advertisement. It is very crucial since internet is very powerful to boost positive or negative perspective. After this app is installed on smartphone, users can select which city they live then puts keyword on specific business. Yelp provides not only food or drink shops, but also any other service such as barbershop or clinic. Founder on this app is from renowned company with high reputation and long experience. The important to keep this app is the trust from user. 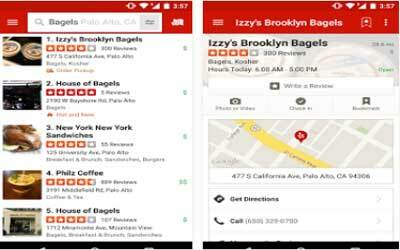 More than hundreds millions people rely on Yelp for Android to get better alternative for goods or service. Search for nearby restaurants, shops, and services. Filter search results by neighborhood, distance, rating, price, and what’s open now. Read millions of reviews written by a community of active, expert locals. Get to know a business through beautiful photos. Find great Deals offered by your favorite local businesses. Look up addresses and phone numbers, call a business, or make reservations directly from the app. Write reviews, check-in to businesses, upload photos, and add tips of your own! Your list of bookmarks is getting some love. The new design is not only better looking, but also more responsive and snappy.